Banana pepper seeds need high soil temperatures to germinate, so in all but the hottest climates start them indoors 40-60 days before transplanting time. Choose a location where the temperature is 70-75° F in the daytime and no lower than 60° F at night. You can grow banana peppers from seeds or set out transplants. When the soil is consistently 60° F or more, set banana pepper transplants 12-24" apart in rows 24-36" apart in well-drained loam amended with compost. If the soil is low in magnesium, dig in a dusting of Epsom salt. Plant sweet and hot banana pepper varieties as far away from one another as possible to avoid cross-pollination. You can expect sweet banana peppers to have a mildly tangy flavor from cross-pollination. Use a plant starter solution to prevent transplant shock. Banana peppers like soil consistently moist, but not soppy. Use a soaker hose if needed to accomplish this. 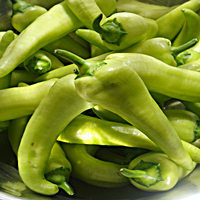 It is best to pick banana peppers when they turn from a green color to a more yellowish tint. 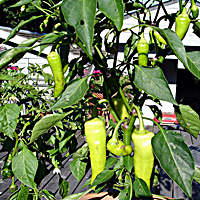 Pick banana peppers often so the plants will continue to produce. This is key to receiving maximum output from your banana pepper plants. Use garden shears or scissors to cut banana peppers and a half inch from the top of the pepper. Do not pull banana peppers from the plant as this could damage the plant. 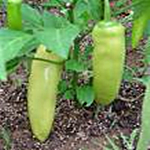 For more information on harvesting banana peppers, please see the How To Pick Banana Peppers page. Knock off aphids with a strong shot with the water hose (not too strong though, we don't want to damage the plant); use a mild soap solution to treat heavy infestations. Insecticidal soap is the best type of soap to use for aphids. Handpick any beetles or caterpillars as you find them. If whole banana peppers rot, check the pepper for maggots or corn earworms and destroy the entire banana pepper plant if found. You can avoid bacterial problems through clean cultivation. Banana peppers can become susceptible to blossom end rot. Control blossom end rot by providing consistent moisture throughout the season. This is best accomplished by using a soaker hose. You will appreciate having banana peppers when you pick your first batch, and serve up in a salad or added to your favorite spaghetti recipe..